One of the simple pleasures in my life is a walk, I find open skies and hills quite literally 'restore my soul'. Having two kids and responsibilities does mean that I can't always tip them out the door and go trekking unfortunately, but if it's persisting it down with icy rain on a cold winter's day, this book is the perfect half-way house. A quick dose of CBeebies and a snatched half an hour with a book such as this is not a bad alternative to a walk. It features everything I love about a relaxed amble by waterways and with the dry, witty and informed company of Griff Rhys Jones. 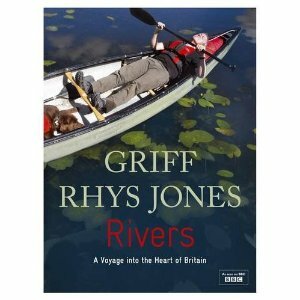 This book is the background and the accompaniment to the TV series 'Rivers', presented by Griff Rhys Jones. He travels along sections of British rivers via all manner of craft, ranging from canoes to barges with a chocolate labrador for company, whilst chatting and mulling over the history of these places and sometimes environmental issues. It is quite a slow moving book that diverts and dabbles with lots of different water related subjects, which suits me fine. This is the perfect pick up / put down / pick up again read - I often find books that race along exhausting and the cause of late night reading leading to shattered bleary eyed mornings. There's a lot to be said for a calm read, which this most certainly is. Griff Rhys Jones is quietly a very funny man, not one of these celebrities that make you fall over laughing maybe (well, in my opinion that is), but I do find his self deprecating, wry sense of humour really amusing. He seems to have quite strong opinions on some subjects, for example wind and water power - which he's honest about, and his thoughts and observations are very interesting to read as a result. All in all, I've gained a new respect for this author and presenter. I'd never read any of his books before this one, and had never really seen any of his recent programmes either - but I'll definitely go and dig them out now. Rivers is a lovely, meandering book that is funny and interesting - with the added bonus of beautiful photographs and some fascinating old maps. I'd definitely recommend reading it if you have an interest in places, people, history and the environment and boats of course! This book can be bought from WHSmith for £16.98 if you're interested in getting hold of a copy.